Get where you're going with the wind at your heels! 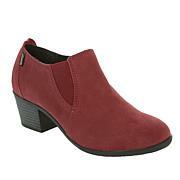 These sleek suede wedge booties are a fashionable way to breeze through the season in style. And they're waterproof, making them the worry-free pair to wear, rain or shine. 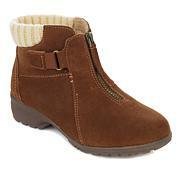 A really cute wedge ankle boot to wear with my skinny jeans. I wanted the black but it sold out in my size, so I got the taupe which is just as nice. Love that it's waterproof too. The tassle on the back adds a little pizazz. These arrived as I was getting ready to leave the house. I tried them on. They were so cute and comfortable I ended up wearing them. Love them! Bought them in Fawn, then ordered the Tan. Just as good. Wish they were available in Black. Hope to see them come back next year. Was concerned about heel height, but so it's been okay. Love Sporto for winter wear because I don't ruin shoes if I get them wet, and they're warm. I ordered an 8W in tan glad I did the wide is not very wide but good for me. The inside is great without wearing socks soft, not hot but comfortable. Love the comfort of wedge. On sale great price. 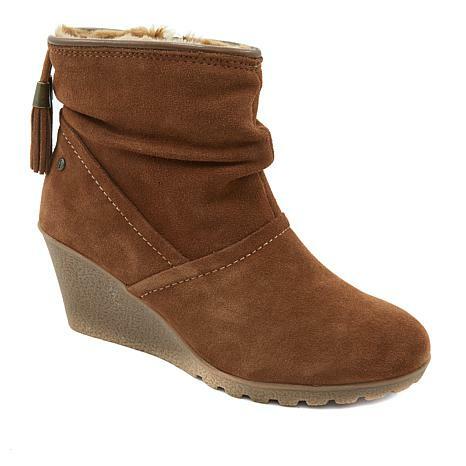 Wedge Bootie five stars and more! Love these shoes! Very comfortable for me here in Chicago. Keep my feet very warm. Love, love, love, thank you.